Star Wars: Episode VII will start shooting at Pinewood Studios near London in May, its producers have said. Disney and Lucasfilm confirmed the latest instalment in the series would be set about 30 years after the events of Episode VI: Return of the Jedi. It "will star a trio of new young leads along with some very familiar faces", the press release added. Star Wars: Episode VII, directed by JJ Abrams, will be released in cinemas on 18 December 2015. 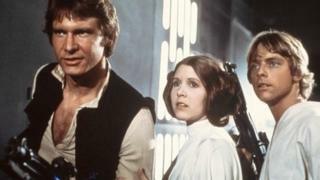 The news of a return for "some very familiar faces" will fuel rumours that the stars of the original trilogy - Mark Hamill, Harrison Ford and Carrie Fisher - will appear in Episode VII. According to the Hollywood reporter, Adam Driver is in final negotiations to play the main villain. They were a "street smart and strong" orphaned girl in her late teens and a "smart capable" man in his late teens or early 20s. It is not known whether any of the actors eventually cast in the film were found through the open auditions. Episode VII will be the fifth Star Wars movie to to be shot in the UK. The original Star Wars trilogy was filmed at Elstree Studios in Hertfordshire, while The Phantom Menace began shooting on 26 June 1997 at Leavesden Studios in Hertfordshire. George Lucas directed a bluescreen sequence with actors Ian McDiarmid and Ray Park, who played Senator Palpatine and Darth Maul.